SAN DIEGO (CBS 8) - Pictures and video of a baby dolphin that apparently died after being passed around by a group of beachgoers in Argentina has sparked internet outrage and a harsh response from Argentina’s wildlife foundation. According to CBS News, a group of people gathered around the baby dolphin after plucking it from the sea at a beach resort in Santa Teresita. The dolphin is believed to have overheated and died while out of the water. Pictures of the incident were posted to a now deleted Facebook account by Hernan Coria, showing people taking pictures with the dolphin. 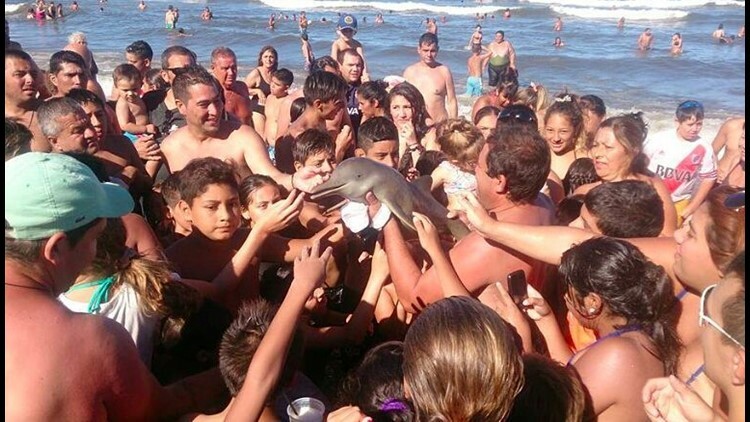 The Argentine affiliate of the World Wildlife Foundation posted a letter to its website, reporting that two Franciscan dolphins were pulled from the water by beachgoers and that at least one of them died.